Bell Art was inspired by the love of the Australian bush. 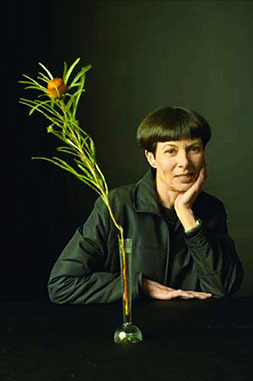 It evolved from Australian still-life artist's Meryl Bell's desire to capture Australian native flora and share their unique beauty with the world. Bell Art gives us all the opportunity to enjoy what she discovered. It began with the design, printing and selling of one card more than 30 years ago. Today, her remarkable legacy of over 200 magnificent artworks has been adapted to an exquisite range of aromatics, exclusive gifts and stationery for all to enjoy. Meryl's legacy is continued and enhanced by her daughter Amanda and her team, who are all just as passionate about spreading the joys of Australian flora across the globe. Together, they look forward to bringing you more beautiful and practical products and souvenirs, guided by the Bell Art ethos. "Many Australian artists have made us visually aware of the vastness of landscape, the light and colours of the country, but there are also many surprises and delights to be found in the intricate structure of plants and their vibrant colouring. If my paintings make people stop for a moment to look, enjoy and wonder then I have succeeded." Born in Bridgetown, in southern Western Australia, Meryl's early influences both through her parents and the rural setting in which she lived, spawned a lifelong love for the unique plant and animal kingdoms in Australia. This met with another of her great passions in art practice and appreciation, when Meryl began painting Australian native flora in 1974, using oils and techniques similar to those of the great 17th century Dutch floral artists. Each of Meryl's major paintings would take many months, or even years, to complete. At times, she would use a single-hair paintbrush to enable her to capture the exquisitely fine detail of her subjects. She marvelled at the synergy between the native plants, animals, birds and insects which live together and depend so much on each other. She included many small creatures in her paintings, something which has become a much-loved hallmark of her work. Meryl passed away in 2009 after a brave fight with leukemia. We aim to honour Meryl's memory with our continued work through Bell Art. We take heart in the wondrous works she created, which represent the profound joy she found in Nature. Her art serves as a constant reminder to us all to take the time, as she did, to appreciate its bounty. Our aim is to run an ethical, service-oriented business that brings greater awareness and appreciation by others of Australia’s natural environment and the need to conserve our indigenous flora. As such, we are cognizant of the need to respect our natural environment whilst appreciating it. This is a deeply held value we espouse not only in the way we run our business, but also in our day to day living. Central to our business ethic is the aim to use the knowledge, talent and skills of Australian designers, printers and manufacturers to produce products of a quality standard equal or surpassing imported products. This not only supports our economy but also assists us in avoiding the excess emissions, energy and waste produced from engaging overseas manufacturers. In our aim to create useful products and souvenirs, we also focus on using quality materials and presentation whilst keeping our products affordable to a broad market. We design wherever possible for minimal packaging and recyclability. We use environmentally responsible materials wherever we can and utilise printing and manufacturing methods that help minimise waste.